Habitat: Upland. This wildflower grows in rocky areas in pine-oak woodlands, grasslands, chaparral, and mountain canyons from 4000 to 6000 feet (1200 to 1800 m) in elevation. Description: The floral tubes are beak-like, mostly yellow or greenish in color, enclosed by hairy, red or orange, entire (unlobed and untoothed), lance-shaped, petal-like floral bracts, and well-exserted from the much shorter bracts. The flowers are followed by egg-shaped seed capsules. The leaves are green, sessile, alternate, hairy above and below, thin and lax (not rigid), spreading to semi-reflexed on the stems, all simple (undivided), all entire, and linear-lanceolate in shape. The stems are erect, much-branched, and covered with long, straight, stiff, unmatted hairs. The plants are partial root parasites of nearby plants. The similar Sierra Woolly Indian Paintbrush (Castilleja lanata), Wyoming Indian Paintbrush (C. linariifolia), and Huachuca Mountain Indian Paintbrush (C. patriotica) have toothed or lobed floral bracts and/or upper leaves. 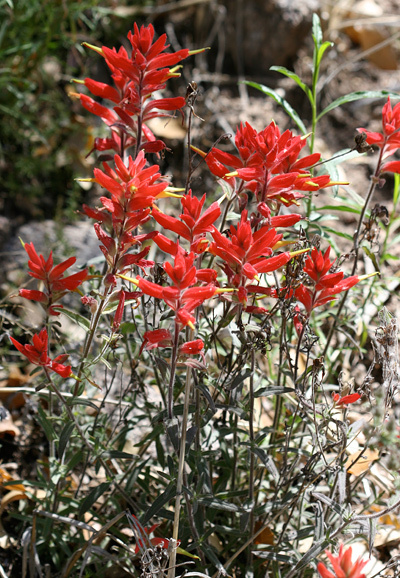 Rincon Mountain Indian Paintbrush (C. austromontana) has leaves that are hairless above. Wholeleaf Indian Paintbrush (C. integra) has stems covered with woolly, appressed, matted hairs and leaves that are almost hairless above. Lesser Indian Paintbrush (C. minor) has less showy flowers with very narrow, linear bracts. 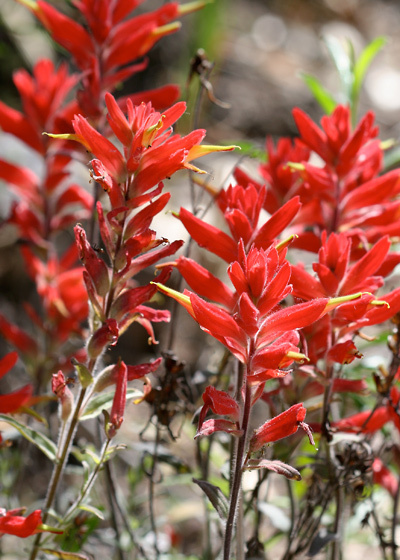 Trans-Pecos Indian Paintbrush (C. nervata) has thick, rigid leaves and non-exserted floral tubes.